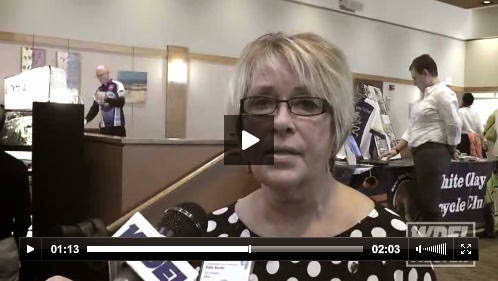 Polly Sierer, Mayor of Newark is interviewed during WDEL's video coverage of the 2014 Heels and Wheels Summit. By Carl Kanefsky -- It was the 2014 "Heels and Wheels: Delaware Walk and Bike Summit," bringing runners, walkers, hikers, and bikers to Clayton Hall, to learn about the health and economic benefits to sustainable communities for walking and biking. "Today, a lot of people are spending anywhere from 25 % clear on up to 40% of their earned income on their transport," said Dan Burden, Executive Director of the Walkable and Livable Communities Institute. "It's the only nation in the world that's doing that and it's not sustainable." Dan Burden of the Walkable and Livable Communities Institute gave the keynote, and says we have to stop planning for traffic, and start planning for people. We also see examples like this, where millions are spent on full segregation as opposed to a much more cost effective treatment, i.e. protected bike lanes. While we embrace Trails and Pathways as a critical part of any bicycling network, it is no surprise that such a movement enjoys wide support from those who see road bicycling as dangerous, or worse yet, a nuisance while they are driving. Advocating for bicycle on-road safety and awareness is where we diverge from Bike Delaware, the State's leading advocacy organization. Regardless of how many trails are built, the vast majority of folks will never have ready access from their home to every destination. Past and current land use patterns have all but sealed our fate in this matter.